This is a 12 x 8 Waltons shed that is windowless. This gives the building immediate security, because opportunist thieves will not be able to see the contents. This is a great feature, and it means that you can confidently store your items inside the building. But that is not all the building offers. There are extra tall eaves and the apex roof brings a feeling of real spaciousness to the shed. This is a great aspect of it, because it feels like the shed uses every inch it has. 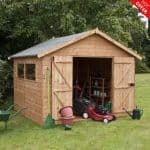 You might also like to see the top 20 discount sheds currently on sale in the UK by visiting the WhatShed discount sheds awards league table. The timber is rather special too, and it has been planed and rounded for extra strength and resistance to damp. You therefore have peace of mind that comes with knowing the structure of the building is sound. There is a 10-year guarantee against rot, and a rim lock fitted as standard. All in all, it is a secure and safe building. The first thing that jumped out to us with this shed was the windowless design. The majority of larger sheds tend to come with at least one large window. The fact that this model doesn’t have one gives the impression that it is built with ultimate security in mind. It has a robust, planed design and is capable of storing anything from lawnmowers to bicycles and other large machinery. Though it has a pretty basic look, there is nothing basic about the features that come with it. 12mm tongue and groove cladding – High quality tongue and groove cladding provides an extremely strong, long lasting design. It has also been planed to ensure a smooth finish. Large double ledge doors – Opening out to provide a generous amount of space to manoeuvre items in and out of the shed, the large double doors boast a great ledge design. 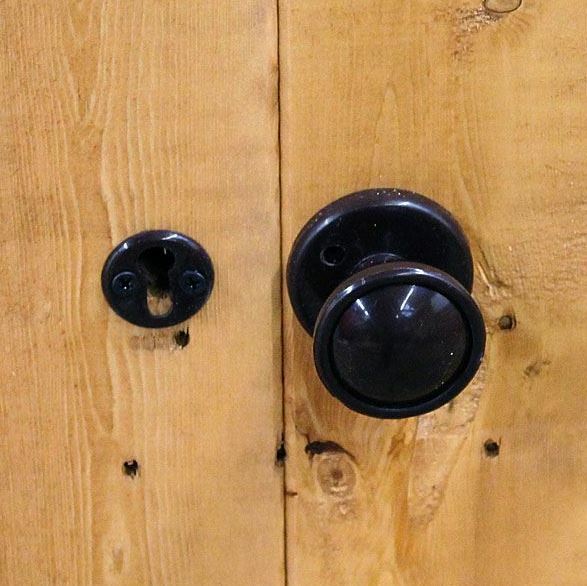 This means you can choose to install and hasp and staple for extra security. Windowless design – The windowless design helps to deter opportunist thieves. Nobody can see what is stored inside. 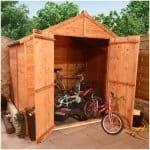 10 year anti-rot guarantee – With the 10 year anti-rot guarantee you don’t have to worry about the longevity of the shed. Heavy duty mineral felt – To protect the roof against the elements, heavy duty mineral felt is included in the cost. Traditional apex style roof – The apex style roof is one of the most commonly used on modern sheds and it isn’t hard to see why. Not only does it look fantastic, but the roof’s design also ensures any rainwater runs down off the roof to prevent build up. The benefits don’t stop there either. Apex roofs provide extra interior height, providing a maximum amount of space. Rim lock – The shed comes with a high quality rim lock to ensure only you have access to what is inside. 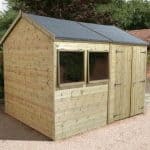 The manufacturers have really focused on maximising the safety of the shed thanks to its windowless design, rim lock and heavy duty construction. Not only is it safe from intruders, but it also has an incredibly stable, solid build. This makes it safe to store even heavy, bulky items. The rounded and planed framing also create a smooth finish, free from splinters. We like that everything about the design has been created with safety in mind. As you would expect, the shed does pose some challenges in terms of assembly. The instructions themselves are easy to follow and the boards fit together perfectly. The trouble comes in the form of heavy lifting. It is a labour intensive job that will take at least a few hours to complete. Never try to build the shed by yourself. We are a great fan of the 12mm tongue and groove construction used on this model. Helping to provide a structurally solid build, the thick boards ensure the shed is safe, strong and able to store heavy, large items. The timber has also been planed to ensure it gives a smooth, even finish. This also means there are no risks of splinters, making it safe for the whole family. 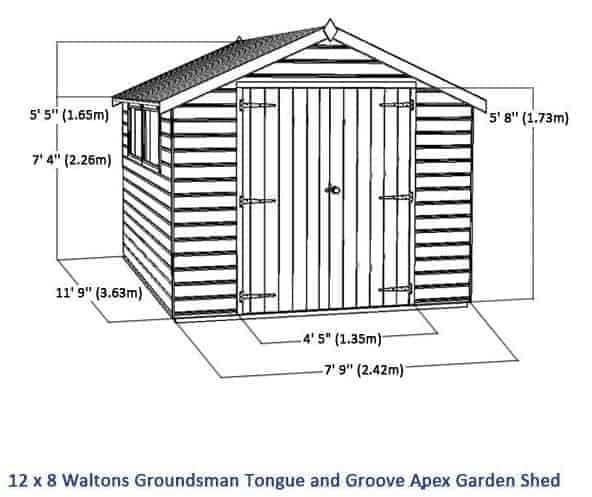 The size of the shed means you can store practically anything and the extra tall eaves and apex roof help to provide maximum interior space. We really can’t fault its quality. The one main disadvantage of the shed however is its cost. 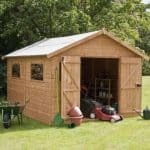 Due to its high quality construction and large size, it isn’t the cheapest shed on the market. However, in terms of value for money we think the initial cost is actually repaid over time. 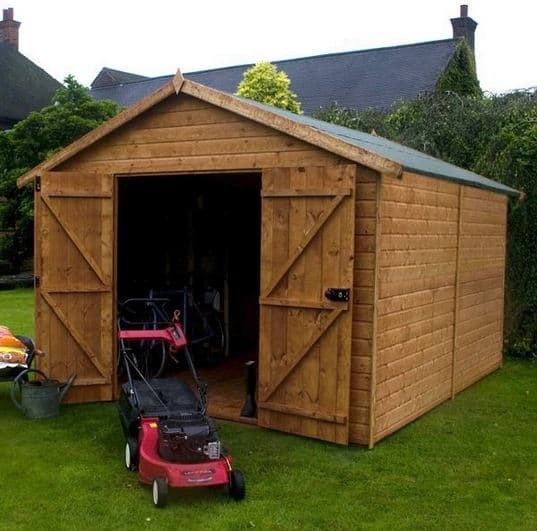 We highly recommend this shed if you’re looking for a safe, secure and large storage space. 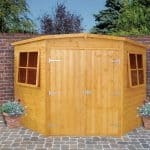 You will struggle to find a higher quality shed with such a huge focus on security. Walton’s are one of the best manufacturers on the market and this is a fine example of the high quality you can expect from the brand.